The strongest and most durable tempered glass, with an industry-high 9H hardness rating (harder than a knife), Makes it almost impossible to knife, keys and other sharp objects scratch. Made from better stable material, the jininges screen protector is more durable and not easy to broken, even it’s broken by really strong impact, the glass fragment will still keep in one full piece, much more safety? pecial anti-oil coating makes fingerprints and oil not easy to stay on the surface and easy to clean. Only 0.25mm thickness and with impressive 99% transparency, you can enjoy the phone’s original viewing experience and touch sensitivity, without noticing this screen protector. ULTIMATE PROTECTION: 100% HD, Edge-to-Edge protection, it is strong enough to protect your screen from drops, cracks and scratches. And it makes your phone a completely new look. ANTI-SCRATCH & ANTI-FINGERPRINT:It is up to 9H hardness, which protects your device from daily scratches, dust, scrapes and normal signs of wear. Topped with oleophobic coating to reduce fingerprints. 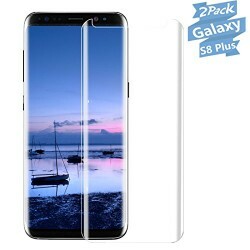 CASE FRIENDLY: Covering most of the curved edges, this screen protector leaves an open space Compatible proper installation and case compatibility. 3D CURVED EDGE: It can provide more comCompatibletable handle feeling than the right angle edge, and will never hurts your fingers. ORIGINAL TOUCH SENSITIVITY: The ultra thin screen protector promises full compatibility with touchscreen sensitivity and preserves your phone’s original high-response touch feeling without any interference.